John started his Ophthalmology career by chance when taking up a casual locum position as a Senior House Officer in Ophthalmology at the West of England Eye Infirmary in Exeter, England. One thing led to another and John stayed on for 18 months by which time he had seen the light and committed himself to a career in Ophthalmology. After a brief stint studying in Bristol, England, while his wife Lizzie trained as a Midwife, John returned to New Zealand to undertake formal training in Ophthalmology in the Auckland/Hamilton rotation of the Royal Australian and New Zealand College of Ophthalmologists (RANZCO). After 4 years of training John distinguished himself at the Fellowship exams by winning the medal for excellence as the best candidate in Australia and New Zealand. John then undertook special training in Paediatric Ophthalmology and Strabismus, spending time at The Children’s Hospital at Great Ormond Street, London before completing a 12 month Fellowship at the prestigious Children’s Hospital for Sick Children, Toronto, Canada. 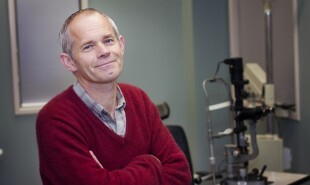 John took up his consultant position at Waikato Hospital in 1994 and entered The Hamilton Eye Clinic in 1997. John now has more than 20 years’ experience as a consultant Ophthalmologist. He attends to all manner of children’s eye problems and has a busy general Ophthalmology adult practice including all the normal conditions such as cataracts and glaucoma. John has been actively involved in teaching Ophthalmology trainees for many years. He has been the leader of the Physiology Basic Science examination board at the RANZCO for more than a decade. Sometimes John thinks he has too many interests! He likes to catch fish whenever he can, both salt and fresh. He grows as many of his own vegetables as he can. He has a workshop and tries to make different things with wood. He keeps fit by trying to run. John is married and has two adult children.